Installing our 18.2 KwH solar system. Yeah, we’re green. Electric green. Solar was not our first choice. Nor were the “hybrid” heat-pumps that cool and heat the house. We wanted to install a geothermal system. Before we jump into renewable energy you need to know that our main mission is to ween this house from propane. When buying the house we knew the previous owner’s propane heating/cooking ran in the realm of 1,400 to 1,600 gallons per year. We are also a family of three versus her one, so our usage should be more. Fearing inevitable high gas prices (propane rose over $5 a gallon the winter before), mixed with a need to take advantage of current tax cuts (renewable energy refunded up to 33% at the time), the fact that we had the cash, and a desire to cut monthly utility spending we knew we were going to do employ some sort of renewable energy system. The battle of propane was nasty and still hasn’t been settled. Suburban Propane may or may not have purchased some company that the previous owner originally contracted with. There aren’t any records to source. What I do know is that Suburban Propane is the worst company for customer service I have ever dealt with in life. Giving them a single penny makes me incredibly angry. So, we aren’t just money-motivated to stop burning propane; I’m pissed to the point where I’m on a crusade. 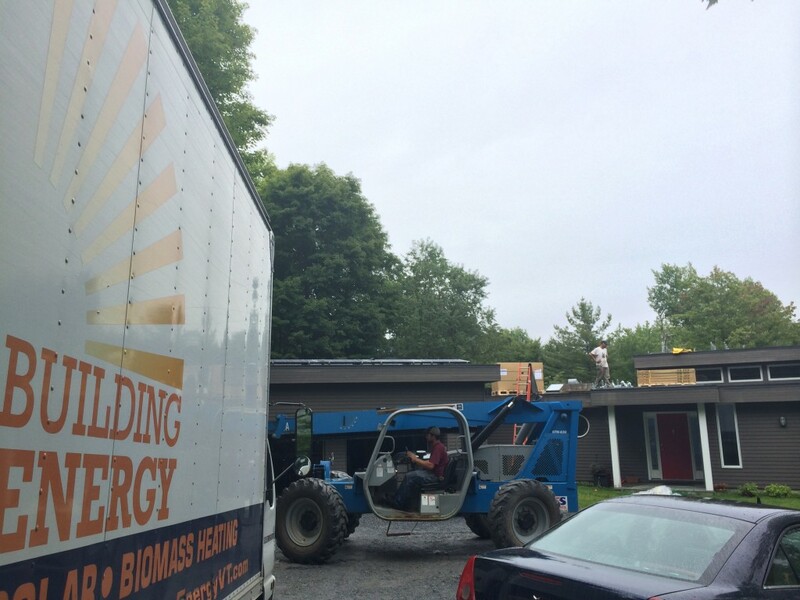 With that goal in mind we began work with one of my favorite companies: Building Energy. Not only did they install a 300+ panel solar system atop the place Jess & I work, but the owner was the main contractor on our house! We began the relationship with Building Energy through a comprehensive energy audit performed by Scott Gardner (the owner). Scott wanted to show us things about the house he built while seeing how his 1999 design stood against a 2014 audit. Our Energy Audit can be seen in full. While performing the audit we also spoke with geothermal installers and found that the drilling alone was going to cost three times the budget I had set for the entire system. So, we began talking solar along with installing electric appliances and water heating. The tough sell, for me, was on the Mitsubishi cold weather heat pumps. I knew they were quiet and knew they brought the bonus of air conditioning, but I struggled with their appearance. Outside and in, those things don’t integrate well with an open designed house like ours. I won’t dive too deep into design tastes, but can tell you we did find a way to make the heat pumps work. We’ve got a full year on them and think they’re a phenomenal way to heat/cool a house. We updated the washing machine, clothes dryer, refrigerator, dishwasher and removed an extra freezer. Then we replaced the 15 year old propane-burning-80 gallon hot water heater with State’s 80 gallon version of the Hybrid Electric hot water heater. Propane still powers the stove-top burners and supplies the primary heat in our son’s bedroom while serving backup duty to the heat-pumps. Due to an ancient humidifier blowing off the side of a furnace we wasted a good chunk of propane last winter. Unfortunately, the blowout wasn’t found for maybe as much as 3 weeks due to it happening in one of the boiler rooms we only visit when things are suspect. I calculate that cost us well over 50 gallons of fuel. Mix that with 6 weeks of consistent below zero temperatures and we used around 800 gallons of propane for the 2014/15 winter. Fortunately, burning dead dinosaurs (gas) is very inexpensive right now, but we do not know if our first winter in the house is truly representative of what the 2015/16 propane usage will be. I’m very happy to say the power company owes us around $1,200 right now. Our power bill as of August 2015. As of September 21st, 2015 we have generated 14.4 MwH for 2015. This is a bit shy of the system’s overall yearly estimates of around 19 MwH, but there is still time before the snow comes and the sun dips super low. I am doubtful we’ll hit the estimate because the early summer months were incredibly wet and overcast. Can’t beat nature. 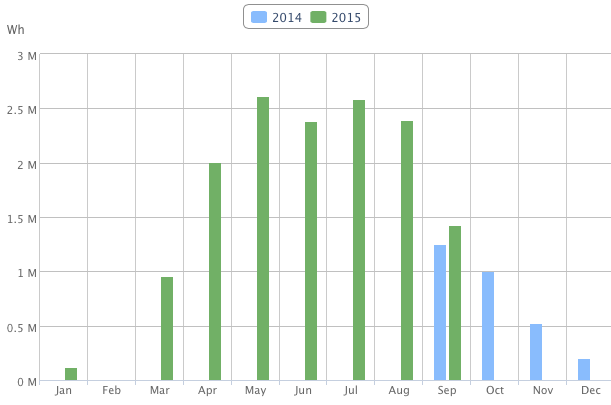 At the end of our first year with a net-metered solar system and nearly 100% appliance renovations we’re pleased. We want to live luxuriously without worry of having to watch every light bulb or power outlet. Hopefully we won’t have any issues this winter so we can get a much more reliable estimate of what our true utility costs are now. I’m guessing we’ll put around $400 into the propane tank soon and will probably eat through our $1,200 electricity surplus somewhere between January and March if we have another super-frozen winter. All in all I would estimate our annual utility bill to be less than $1,000 for heating/cooling a 4,000 square foot house. Not bad! We refilled the propane tank and found that we have burned around 500 gallons since purchasing the house. That’s one winter and a little bit of this year’s autumn. I can only guess our actual usage, assuming we have no more hiccups with the furnace, is more like 300 gallons in a year. That means we’ve reduced the annual consumption over 1,100 gallons by switching to heat pumps and a hybrid hot water heater. We’re currently working with local contractors on installing a wood stove. If we can knock out the heating needs for propane we’ll probably be filling the tank once every 5 to 10 years! By the way, the recent fill up was at $2.55 per gallon making the total fill up a little over $800. When gas prices go back up a wood stove will pay for itself quickly. My last comment may be confusing, so let me clarify the math on our propane bill. We have had the propane tank filled twice since purchasing the home. The first time was less than 300 gallons and this last time was exactly 350.4 gallons on November 6th, 2015. At a price of $2.52 per gallon that bill came out to $883.01 so I was bit off in my estimation within the last comment….sorry. I also think we’ve burned more like 600 gallons in the last year and a half, so we really only shed 1,000 gallons over the previous owner. Not bad for a family of 3 during one of Vermont’s top 3 coldest winters in recorded history. The previous owner was just 1 lady.